Nothing fancy, sixty year old, furnished 4 bedroom farmhouse for rent. Fantastic scenery from every window. Peaceful, serene setting. 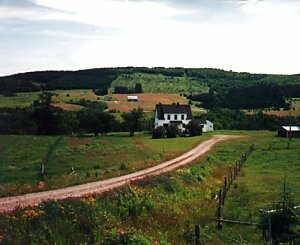 Situated on Margaree River, Cape Breton, Nova Scotia, Canada. On route to Cabot Trail. Easy driving distance to numerous country dances, festivals, and beaches. 15-20 minute drive to Cabot Links Golf Course. For more information, please e-mail: theresa.maclellan@cdha.nshealth.ca. Other Pricing:     Additional charge for more than 4 persons.